Apparatus used by R Watson Watt to detect radio echoes from aircraft, 1935. Portable copying apparatus, c 1800. 'Mobile X-ray apparatus' catalogue, 1930s. 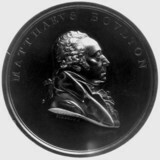 Matthew Boulton, English engineer and industrialist, late 18th century.